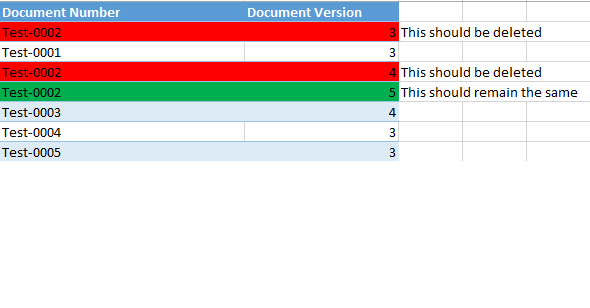 I am working with SP 2010 Sharepoint Lists where the list items is having unique column " Document No" and each items are having "version". Each time the list items are getting updated/New items are created with the same document no and with new version no(incremental) through workflow. I would like to keep one list item for any Document number and the Version no should be latest. This code should do the work - please adjust variables to match Your enviroment. And You can switch between READ and DELETE mode by changing variable $selectTRUE_or_deleteFALSE - I suggest You to execute READ first to be sure, that code works as expected and verify items that will be deleted. Only after that, execute in DELETE mode. $query.Query = "<Where><Eq><FieldRef Name='$columnName1' /><Value Type='Text'>" + $docNumb + "</Value></Eq></Where>"
Not the answer you're looking for? Browse other questions tagged powershell duplicate version or ask your own question.